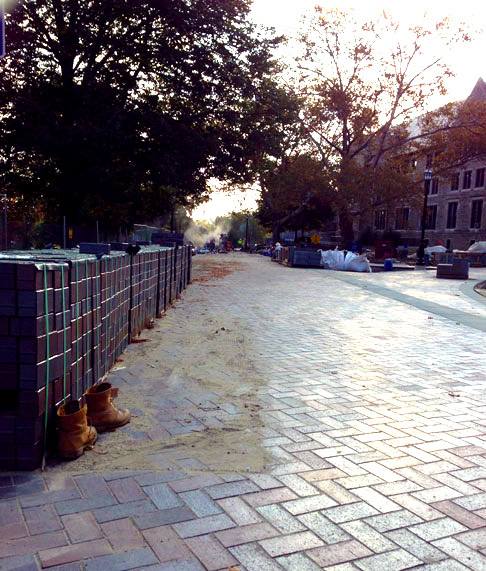 Falvey Memorial Library :: Foto Friday – How Many Brick Pavers Does It Take to Complete a Landscaping Project? Foto Friday – How Many Brick Pavers Does It Take to Complete a Landscaping Project? The workers are models of persistence, setting approximately half a million brick pavers, individually. Occasionally a vehicle’s horn playfully toots “shave and a haircut”; a dump truck’s powerful bass horn answers “six bits.” This exchange appears to break the tedium and bolster morale. In late September, my own morale was bolstered by significant evidence of progress. Fences that have restricted access to the Library for months had been moved, revealing a gently curving path from the library’s entrance to the grotto. 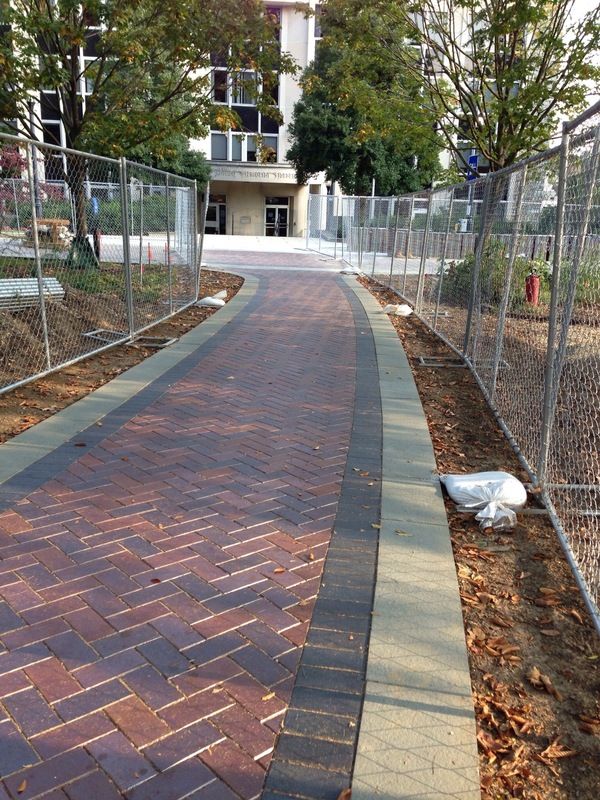 Students instantly began using the walkway, getting a sense of Phase III’s completion. I wonder: who will set the final brick paver? Article by Gerald Dierkes, information services specialist for the Information and Research Assistance team, senior copyeditor for the Communication and Service Promotion team, and a liaison to the Department of Theater. Photographs by Luisa Cywinski, team leader of Access Services and editorial coordinator on the Communication and Service Promotion team.